Brand new modern sea view house composed of two bi-level apartments with in total 6 bedrooms and 6 full bathrooms totalling 238m2, plus 50m2 Basement, and a 74m2 rooftop terrace . The lofty upper-level apartment unit consists of a living room with open kitchen , three bedrooms, one of them with terrace, three bathrooms and a laundry room. Exterior stairs lead onto the rooftop terrace with panoramic views over the Figueretas Bay, and Ibiza town. 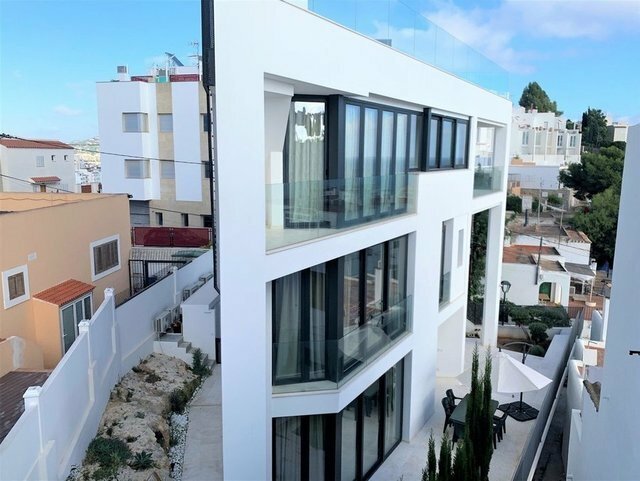 This new contemporary building was completed in 2017 and is located in Los Molinos , a ten minute walk from the center of Ibiza town and the beaches of Figueretes and Playa den Bossa. The lower-level apartment unit consists of a living room with open kitchen, three bedrooms, one of them with terrace, three bathrooms and a laundry room.